Wow, it's been a long time since posts. That's mainly because it's been a long time since I made anything. I hate how mojo-less I've been feeling lately! Getting my craft space in order ASAP is top priority right now! I hate not having everything 'just so'. Time to get it finalised so I can get crafty! Anyhoo, I sat down to have a bit of a play last night and these two cards came out. My first card is very soft and subtle. 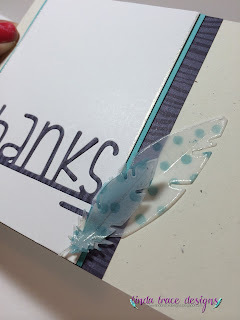 I had several of the Simon Says Stamp feathers, diecut out of a piece of thick vellum, and I saw it laying on my desk and thought it would make a great stencil. I was right! I love this effect! I diecut the feathers out of vellum, and stamped on them with the SSS Nautical Borders stamp. 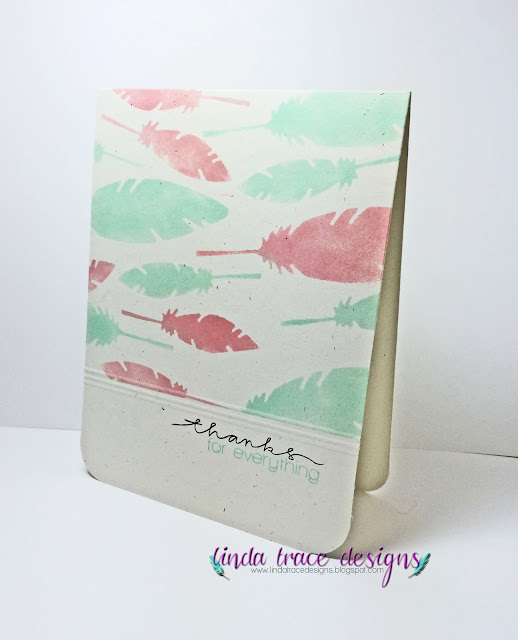 I layered it onto some Avery Elle aqua cardstock, then added a strip more of the MME paper and adhered the feathers! For a finishing touch I added a border of Sakura glitter pen around the white panel and the feathers. Well, that's it for me today! I'll be back again soon I hope! A layout over at Neat and Tangled.